A Review of Ken Sharp’s "Elvis Vegas ’69"
Much has been written about Elvis Presley’s return to the stage in 1969 at the International Hotel in Las Vegas. However, in his book, Elvis Vegas ’69, Ken Sharp has come nearest to telling the full story surrounding Presley’s record-breaking comeback that summer. First, the tale of the tape on Sharp’s book: hard bound, 8 ½ X 10 ¼ inches, 208 pages, published by Jetfighter in 2009. Bursting with photos, Elvis Vegas ’69 is visually striking, and for those fans who never tire of seeing new images of Elvis, this book will certainly be worth the $50 price tag for the pictures alone. I counted nearly a hundred shots in color and black and white of Elvis on stage in Vegas. Full-page treatment is given to over 20 images, including the front and back cover. In addition, there are several dozens backstage photos and another 30 or so images of promotional material relating to Elvis’s ’69 Vegas stint. For visual variety, a sampling of Presley photos from the fifties and sixties are also included. Personally, when it comes to Elvis, I’m more into information than images. The text of Elvis Vegas ’69 is organized in a conventional manner (chronologically) but is presented in a most unusual way. There is no table of contents. Rather, the information is presented in 25 unnumbered chapters. Actually, “chapters” is not the right term; it feels more like a “storyboard” presentation with 25 topics arranged in chronological order. 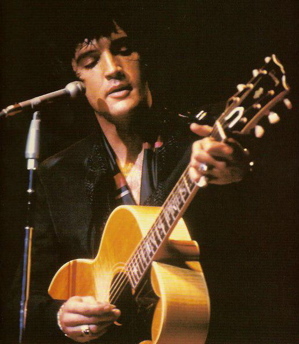 After a couple of introductory sections, the “storyboard” topics begin with Elvis’s decision to return to the stage and then flow through his first show at the International on July 31, 1969, and on to its aftermath. While Ken Sharp is represented as the author of the volume, his role is actually that of editor. On the 123 pages of text, Sharp only contributes about 1,500 of his own words. That includes a one-page introduction, brief lead-ins to each of the 25 sections, and several editor’s notes. 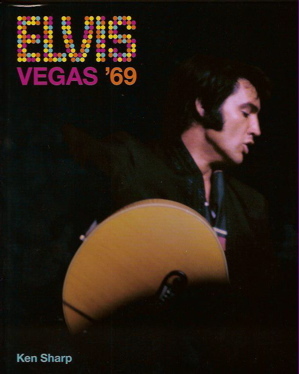 The remainder of the extensive text consists of quoted passages from over 100 people connected in some way with Elvis’s 1969 Las Vegas run. They include musicians, “Memphis Mafia” members, entertainers, Presley family members, songwriters, journalists, fans, music business workers, and hotel executives and staffers. Downgrading Sharp from author to editor should not be seen as downgrading Sharp’s effort, since he has done quite remarkable work in assembling Elvis Vegas ’69. Most of the hundreds of interview snippets in the book come from longer interviews Sharp personally conducted with dozens of his contributors. One can only imagine the difficulty and commitment involved in contacting all those people and coaxing them into contributing meaningful comments. Equally difficult must have been the job of organizing segments from all those interviews to tell a story without the help of narration. In his introduction to Elvis Vegas ’69, Sharp makes his intended audience clear, and it clearly didn’t include Elvis fans like me. 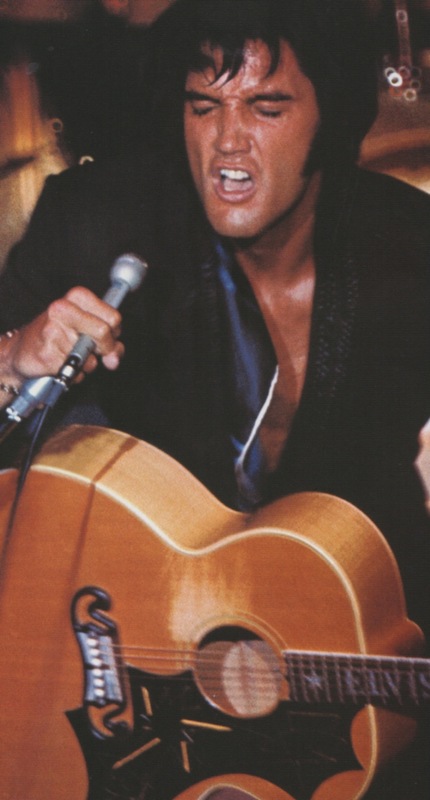 “Elvis delivered the show of a lifetime,” Sharp declared of Elvis on opening night, “proving to all in attendance that he was clearly back where he belonged and poised to carve out an exciting new chapter in his illustrious career.” Could Sharp really vouch for the positive reaction of “all in attendance” to Elvis’s performance? Of course not. Now, I’m a loyal Elvis fan, but not a blind one. With Elvis, as with all things, there are always varying points of view. After reading Sharp’s intro, I suspected only the viewpoint of the Elvis faithful would be portrayed in Elvis Vegas ’69. And indeed it is pretty much an Elvis love fest throughout. “Elvis came out and rocked that city like it had never been rocked before. He reinvented Vegas and did it in his style,” commented Elvis’s friend George Klein. Seemingly hundreds of those types of Presley platitudes are scattered throughout the pages Elvis Vegas ’69. After awhile, even the most fervent of fans must start skipping over them. • How Colonel Parker fought to keep admission to Elvis’s Vegas shows low so that his real fans could afford to see him there. • How head maître d’ Emilio Muscelli allegedly became a millionaire by accepting tips to assign prime seating at Elvis’s shows through the years at the International and Hilton. • How Tom Jones claimed not only that he was the one who gave Elvis the confidence to return to the stage, but also that he “inspired” certain moves that Elvis did on stage. • How drummer Ronnie Tutt claimed that Elvis was not proud of his music in the fifties. 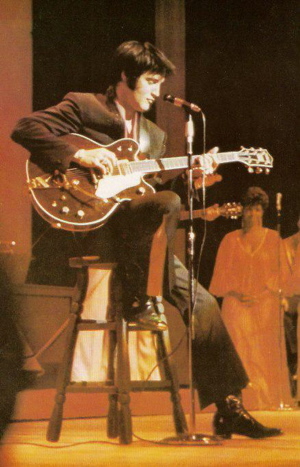 • How Elvis sat in the lounge one night and hollered out songs titles for Chuck Berry to sing on stage. • How Bill Medley reacted when Elvis walked on stage while Medley was singing “You’ve Lost That Lovin’ Feeling” during his lounge act. My favorite story in Elvis Vegas ’69, though, is how Elvis fan Ian Fraser-Thompson brazenly snuck into Elvis’s dress rehearsal, his opening night show, and his post-concert press conference, all on the same day! "After reading Sharp’s intro, I suspected only the viewpoint of the Elvis faithful would be portrayed in 'Elvis Vegas ’69.' And indeed it is pretty much an Elvis love fest throughout."